Sir Winston Churchill died on the 24th of January 1965. An accomplished statesman who led Britain through the tumultuous World War II as an army officer, he went on to pick up the pieces of the United Kingdom after the war as the Prime Minister. Following his political career, he went on to become an eloquent writer and speaker. With such an impressive resume, it’s no surprise that Queen Elizabeth II decreed he would be given a grand state funeral – the grandest the world would see for a person outside of the royal family. She believed his funeral must be proportionate to his position in history, and a document with over 400 pages was prepared after Churchill suffered a major stroke. On 1965, the year of Churchill’s death, the Royal Mint issued British Pound coins in 16 denominations. One of which was the British Crown coin for Churchill himself. In this article, we discuss what its value is, what it is composed of, and why it costs that much compared to other minted Crowns. What Is a British Crown? A British crown is a type of coin produced in the United Kingdom. When England and Scotland became what is known as the UK today, their currency – the English crown and the Scottish dollar – merged into what became the British crown. Its value was five shillings or a quarter of a pound sterling. The crowns were often minted as a heavy silver coin. From 1816 to 1919, every crown composed of 92.5 percent silver, making it a sterling silver item as it met the standards of genuine sterling silver. However, from 1920 to 1946 (most likely due to the shortage brought on by the aftermath of World War I and II), it composed of 50 percent silver while the other half was other durable metals. By 1947 until the British currency’s decimalization in 1971, the crown was made of pure cupronickel, a common copper, nickel, and other minerals to create silver-colored coins. 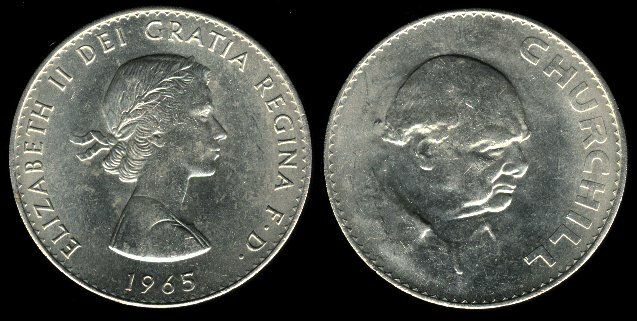 Crowns were minted from 1707 to 1965. Back when crowns were in circulation, these were heavy silver coins weighing around 30 grams. By the 20th century, people rarely used this as legal tender, so the coins were only minted for commemorative purposes. However, crowns were re-monetized in 2018 and are worth 25p, though not many spend these and still view them as collectibles. Even after it stopped being a form of currency after 1971, the Royal Mint would still create crowns during momentous occasions, mostly for coronations, weddings, and other important events in the UK. The Churchill crown has two sides. The heads side of the coin is the profile of Queen Elizabeth II with the year 1965 and the Latin phrase “Elizabeth II dei gratia Regina F.D.” The F.D. refers to fidei defensor, or defender of the faith. 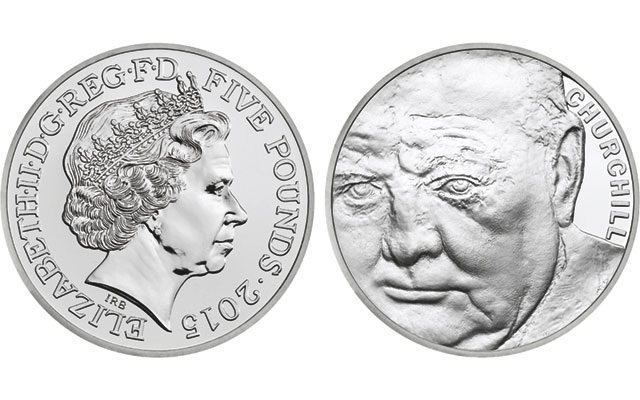 In translation, the phrase proclaims, “Elizabeth II, By the Grace of God, the Queen and the Defender of the Faith.” The tails depicts a profile of Churchill’s face as well as his name etched on the side. Unfortunately, despite the grand life Churchill had and a grand funeral to commemorate it, the value isn’t as high as other coins. When the Churchill crown was released, there were around 19.6 million crowns released to the public and to collectors. That means that, with a population of 66 million people in the United Kingdom, roughly a third of the population should be able to have at least one coin, which means in terms of rarity, no one will have a hard time finding one. In comparison, a 1934 ‘Wreath Crown’ has only 932 minted coins, while the coins for the British Exhibition in New York had a little over a million minted. These are much rarer coins, therefore to collectors, this is the much more valuable one, especially those in mint condition. The Churchill crown, however, was put into circulation and, with 19.6 million circulating the UK and other commonwealths where UK currency was honored, it was a very common coin. So, unfortunately, the value of one Churchill crown of average condition will only get you whatever value a crown is worth – five shillings, or 25 pence. It’s not much, and mint-conditioned Churchill crowns can only get you around £3 or US$ 5. However, if you have a Churchill coin that shows signs of the regular wear and tear, you’re only going to get 25p from coin collectors – assuming they want to buy a very common crown. In fact, if you look at some of the currency and coin exchange websites, you’ll find that some websites offer you much less than 25p for your Churchill crown. In LeftoverCurrency.com, they’re offering 19p for one coin – 6p less than the coin’s face value. Don’t be fooled by the coin sellers on EBay or other trading websites. There are Churchill crown coins sold at over $5, and some of these products I’ve found are in such terrible quality that you can barely see Churchill’s face on the coin. These are sellers that prey on unsuspecting amateur coin collectors who falsely believe that these coins are worth the price. Actually, because it is very common, it’s not a very popular choice among coin collectors. From a selling perspective, the trouble of selling your Churchill coin is not worth it. Thanks to the fact that these are now a part of UK currency once more, you’re better off spending it at face value of 25p instead of trying to get more from it from coin collectors. You could get lucky and find someone willing to spend a few dollars for it, but one online search for the Churchill crown’s true value can quickly dissuade any potential customers for buying your coin for that much. Despite Churchill’s memorable position in history, his commemorative crown coin is lacking in value. Because it is not a rare find, trying to sell it might only get you roughly its face value. If you have a 1965 Churchill coin and are thinking of selling it, you’re better off holding onto it and hoping the other 19.6 million coins get lost and make your own coin rarer in value, or spend it on something worth 25p.